Gifts from the Pirates: "Use your imagination, not to scare yourself to death but to inspire yourself to life"
"Use your imagination, not to scare yourself to death but to inspire yourself to life"
It's got to that time of year again where we go into a craft frenzy. There is something so satisfying about decorating the house for Halloween and Christmas and we couldn't wait this year to get going with the spooky fun. Halloween is so much more fun when you have children and I like to think we take full advantage of these cold wet autumn days by filling them with fun activities. Me and Opeie have been researching fun Halloween craft ideas and while Mrs M had them out doors hunting for branches, leaves and pine cones to make an Autumn wreath for the front door, we also decided that we wanted to create monster wreaths for the doors inside the house. We wanted to make a fluffy monster wreath and speant a week popping into charity shops looking for something suitable to cut up for cheap. 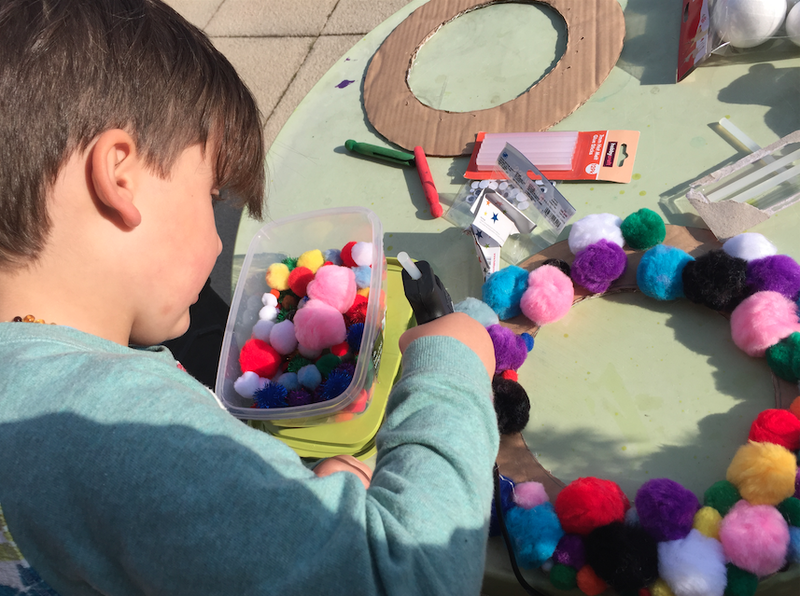 We had no luck and was feeling pretty deflated until I was searching for one of Opeie's toys under his bed and found a huge box of pompoms and lollipop sticks, BINGO! We cut out a big cardboard ring, fired up the glue gun and started sticking. With lots of bright coloured fluffy pompoms to choose from, Opeie was thouroughly enjoying the craft activity, sitting outside despite the cold. There was a few moments where there was a freak gust of wind and he was chasing pompoms around the street but it just added to the fun as he ran around laughing. With the cardboard ring completely covered and looking very bright and fluffy, we added big polystyrene balls for eyes and some black teeth covered in green slime and Hey Presto! our monster wreath was complete. Not 100% happy with what we had achieved though and eager to continue our fun Halloween activities, Opeie opted for another wreath because apparently there are alot more doors in the house to decorate. We looked around the house for something else colourful and found a basket full of Play doh lids that I had saved while cleaning out the boys room a while back.I had no idea at the time what I was going to use them for or why I was even saving them but the bright colours sucked me in like some sort of magpie. I had already cut out a second cardboard ring (clearly I knew he would want to make a second one before he did), so the glue gun made another of his weekly appearences and we got sticking. 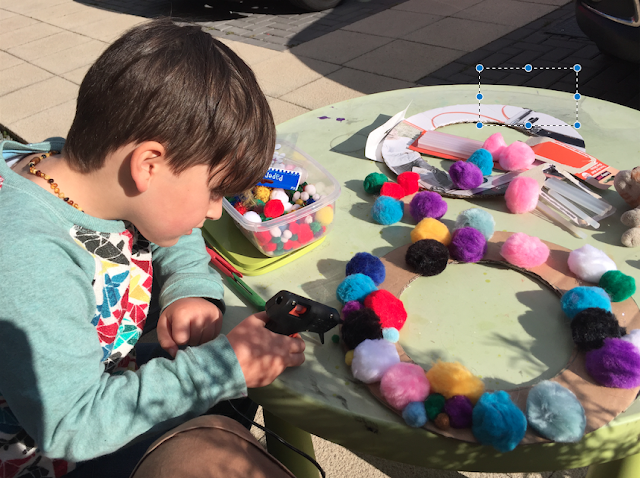 Im not sure my parents would have let me use a glue gun at the age of 5 (I could just imagine myself pretending I had Han Solo's blaster and making a mess everywhere), but Opeie is calm, loves craft and is really responsible so the gluing was left up to him. Opeie made some lovely bloodshot eyes and mad fangs from lollipop sticks and in no time at all , another door in the house was looking fabulous. Weve got so many ideas planned for the school holiday with Seth that the house is going to be filled with lots of spooky things. The great thing is, when they all come down, theres no need to feel sad as we can start on the Christmas decorations then! being a dad is AMAZING!